← Day 43 Does Owen Sound? Another nice morning and an early start. We left the campground at 7:15. 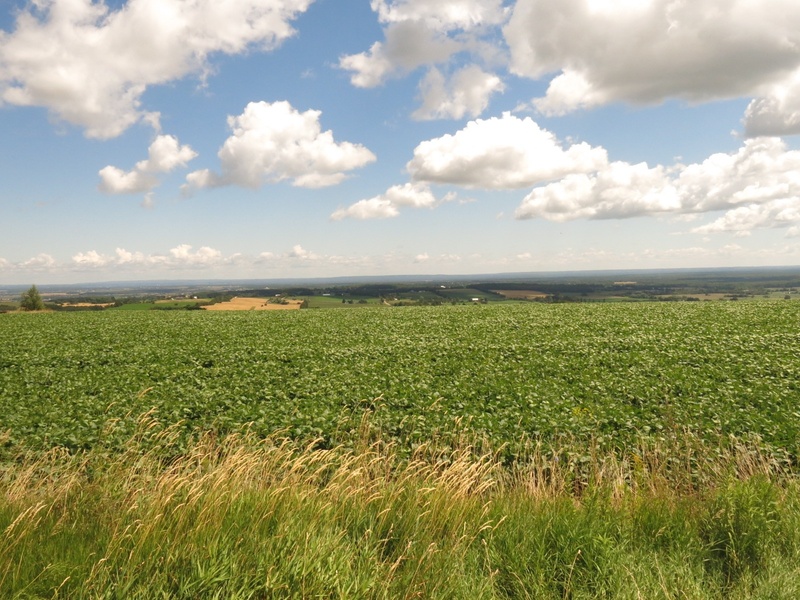 Once again we were riding through very scenic farming country. We stopped at the store in Walter’s Falls and discovered they were closed for the long weekend. There was a sign in the parking lot that said Farmers Market on Saturday mornings. This morning it should have said Farmer Market as there was only one farmer there. I chatted with him for a few minutes and then we were on our way again. Shortly after Walter’s Falls we started to encounter lots of cyclists out for their Saturday morning rides. This was the first time we really had encountered any number of cyclists on the road other than those who were touring across the country. It appears to be a great cycling area as pretty much all the backroads are paved giving lots of options for riding. At the far end of Collingwood we found a fruit stand where we bought drinks and butter tarts. It seemed to be a popular terminus for the locals out for a ride. Around 1 pm we rolled into Creemore. 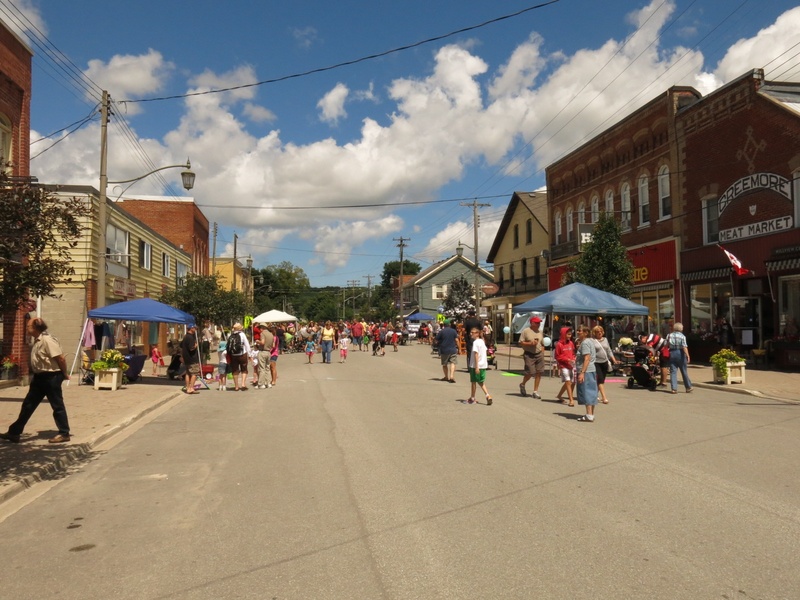 Much of the Main Street was closed to traffic for the Childrens Festival. There were lots of booths set up and lots of families all up and down the street. It looked like they were having a great time. We found a bakery where we had a bite to eat. 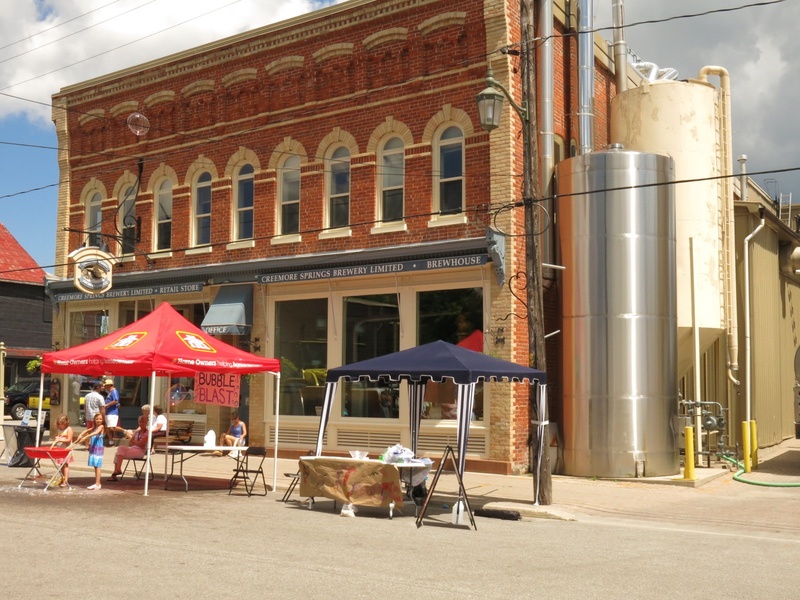 Right across the street was Creemore Springs Brewing Company. If I wasn’t riding it would have been nice to try out their pub and have a beer, but alas we still had another 50 km to ride. 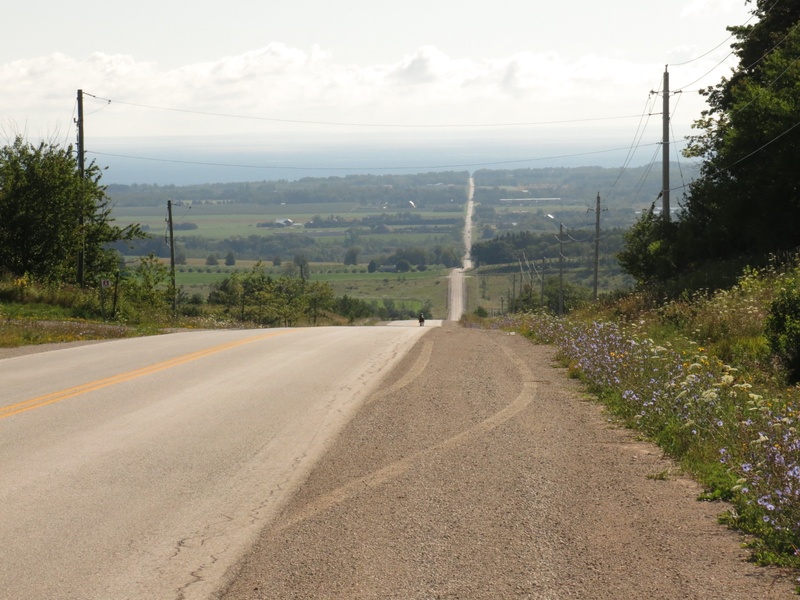 The ride to Creemore had been quite hilly with some very steep but luckily fairly short hills. Past Creemore it got a little easier but there were still a fair number of hills. It likely could best be described as “rolling”. About 10 km from Tottenham we saw a couple of riders going the other way. Elaine commented that it looked like they were wearing Tour du Canada shirts. About a kilometre further we encountered two more ladies who definitely were wearing TdC shirts. We slowed and they asked if we were TdC riders. It turned out that they had ridden in 1988, the first year of TdC! They were out for a ride to greet the incoming riders and told us they would see us later in camp. When we arrived at camp in Tottenham there were several more TdC 1988 Vets there to greet us. It was great meeting them and hearing some of their stories. Of course they were also interested in hearing our stories as well. One fellow had brought his photo album from the tour. Wow, how times have changed. We were surprised to learn that there were about 30 riders in that first year. It sounded like most of them had read about the tour in a newspaper article and signed up from there. One fellow who had come from Guelph with his son (I’m sorry I can’t remember names) said he was 19 in 1988 when he did the tour. About 6:00 pm my friends Sandi and Stan picked me up at the campground and took me to their place in Newmarket. Sandi was a running friend in St. Albert. Several years ago Stan got transferred to Toronto and they moved from St. Albert. It was wonderful seeing them again. I enjoyed dinner with them and an evening of catching up. Sandi had told me to bring my laundry and I jumped at the chance to get it done while we visited. And to top the day off I had a nice comfortable bed to sleep in. Our total distance for the ride today was 159 km.